On this the day of Guy Fawkes or Bonfire Night, I am reminded of a story Arthur Kelloway of Salmon Cove shared with me in a recent interview. “This gentleman boasted that he had a barn full of barrels and tires, and he had his barn secured so that he’d never ever been stolen from. Well three of us heard about this boast and we figured you’re going to regret saying that. So we went and checked his barn one evening, and it was locked up like Fort Knox. But what he failed to see was that he had a flag pole on the front of his barn and a door that he put the hay in on the loft, it was up about eight feet. So I climbed the flagpole, opened the door, went inside and he had a pile of old tires and so on in there. The barrels we couldn’t get out unless we would take them up through the hatch and lower them down on the rope from the flagpole. We cleaned the barn out. The way that we got the tires out in the beginning was we took his horse's reins and we squat the tires together so that they would go out through the manure shutter which was only about a foot and a half by a foot and a half wide - 18’’ x 18’’ wide. In order to get the tire out through we just tied the rope around, collapsed the tire and put it out through. Three of us worked there for about an hour and a half. He, or his wife, just as I came down the flagpole came out on their doorstep to get some water out of the bucket, and they were talking back and forth. And I lid down beside the barn, and the other two guys were still in the barn. They came out eventually, locked up all the doors, closed all the doors, put everything back, hung up everything, straightened away the barn so it looked immaculate, went out through the manure shutter, closed it and closed the door for me on the inside and I came down the flagpole or flag rope again on the side of the barn after closing the outside door. Up until I’d say six or eight months before he died, I told him, because he had always wondered how they got into his barn. The locks weren’t broken, there was no sign of entry, but the barn was completely cleaned out. And I told him about it, and, you know, I think he held it against me even though it was fifty years later [laughs]." It was common in Salmon Cove, and assuredly other parts of NL, for people to steal barrels and tires for Bonfire Night, and it was simply accepted by locals that kids would do this. It's interesting to hear about the lengths to which kids would go in order to have the biggest fire. 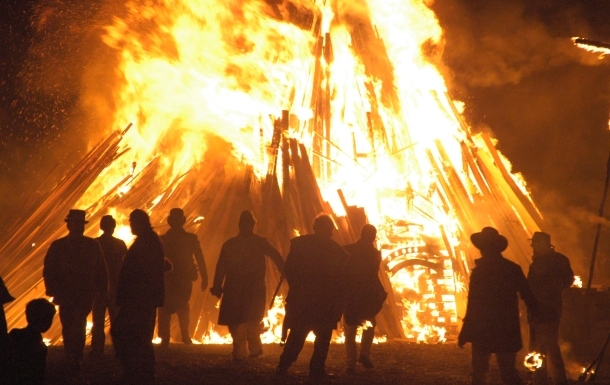 Will you be celebrating Guy Fawkes night with a bonfire?